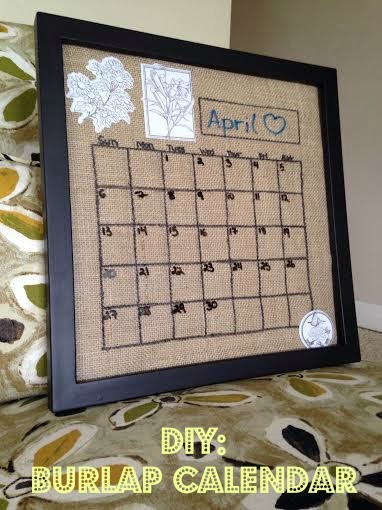 DIY: Burlap Calendar | Finding delight. – Cut a square of burlap so that it will fit in your chosen frame. – Do a little measurement math and sketch out (probably with a pencil at first) the bones of your calendar. I chose to put a rectangle in the top right for writing in the Month and a large grid below it with 7 squares across and and 5 squares down to write in your days. Now, write the days of the week across the top of each square. – Add some swag! I happened to have a bunch of those white/tan cloth stickers in my craft box so I put a few on to really up my Shabby-Chic game. Any cloth scraps cut into cool shapes would look super cute too. – Frame that puppy up and stick it on your wall at home or in your office. – Use dry-erase markers to write in the month and days (which I’ve done for April in the picture above) and all your important appointments (which I’ve yet to do in the picture above).